Western blot analysis on A: HepG2, B: NIH/3T3, C: Rat liver, cell lysates using the Histone H3 pAb. The primary building block of chromatin is the nucleosome which is made up of DNA wound around eight core histone proteins (two each of H2A, H2B, H3, and H4). Histones thereby play a central role in transcription regulation, DNA repair, DNA replication and chromosomal stability. DNA accessibility is regulated through an intricate series of post-translational modifications of histones, known as the histone code, and nucleosome remodeling. 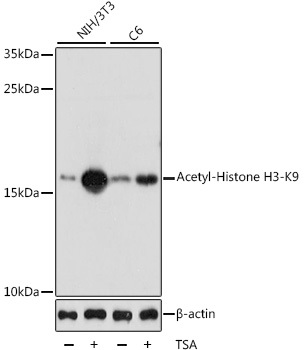 Histone H3 is mainly acetylated at Lys9, 14, 18, 23, 27, and 56. Acetylation of H3 at Lys9 appears to have a dominant role in histone deposition and chromatin assembly in some organisms. Rabbit polyclonal antibody to Histone H3. Liquid. In TBS, pH 7.4, containing 0.5% BSA, 40% Glycerol, 0.05% sodium azide. Synthetic peptide (KLH-coupled) corresponding to a region of Histone H3. Store at 4°C. Aliquot and store at -20°C or -80°C. Avoid multiple freeze/thaw cycles. Fig. 1. Western blot analysis on A: HepG2, B: NIH/3T3, C: Rat liver, cell lysates using the Histone H3 pAb.